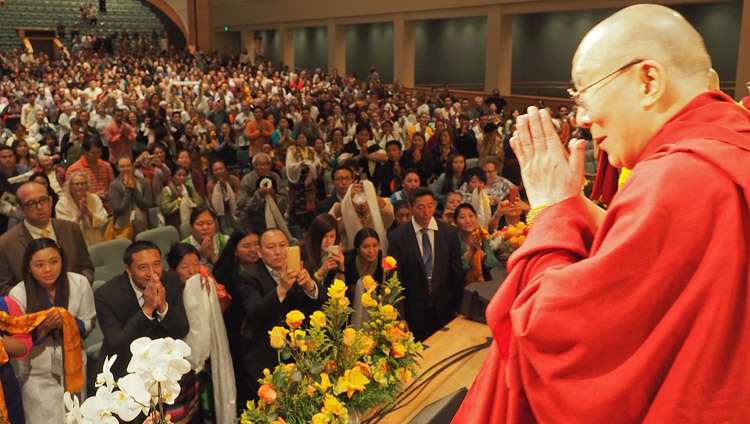 Boston, MA, USA – The morning skies were a brilliant blue as His Holiness the Dalai Lama drove to the Minneapolis Convention Center to meet members of the Tibetan Community of Minnesota today. He was received by Tibetan American Foundation of Minnesota (TAFM) President Sonam Dhondup, who introduced him to State Senator Carolyn Laine, Minneapolis Mayor Betsy Hodges and Congresswoman Betty McCollum. His Holiness then briefly met with them, other Mayors and government representatives before they all took to the stage. Mayor of Minneapolis Betsy Hodges welcomed His Holiness back to Minnesota, saying, “We are proud to have you here.” Mayor Hodges has proclaimed today, 24th June, ‘His Holiness the Dalai Lama day of Peace and Compassion’ in Minneapolis. Mayor Chris Coleman of St Paul has also proclaimed today as ‘His Holiness the Dalai Lama Day’ in his city. He expressed appreciation of what His Holiness had to say yesterday about compassion. Mayor Donna Schmitt of Columbia Heights, which has the largest Tibetan settlement, presented His Holiness with a book of prayers and good wishes people in that city had submitted. State Senator Carolyn Laine, an old friend of Tibet, said, “It’s an honour to be here. We’re always glad to have His Holiness among us.” Several local council members added their greetings. Minnesota Governor Mark Dayton, a strong supporter and long-term friend of Tibetans as well as Congressman Keith Ellison were unable to attend the meeting today, but sent representatives in their stead. His Holiness thanked all of them for their greetings, friendship and support. “Brothers and sisters, we need to see each other in this way. Today, we face problems in many parts of the world, many of which are of our own making. When we are born and just growing up we don’t pay attention to differences of nationality, colour or faith. It is only when we are more grown up that we learn to see each other in terms of ‘us’ and ‘them’. My first commitment is to raising awareness of the oneness of humanity. My second is to promoting religious harmony, of which India is a living example. “My third commitment, as a Tibetan and someone in whom Tibetans inside and outside Tibet have placed their trust, is to them. Since 2011 I have fully retired from political responsibility, which is now in the hands of an elected leadership. What I still feel responsible for is expressing concern about the natural environment in Tibet. Since Asia’s major rivers rise on the Tibetan Plateau and more than 1 billion people are dependent on their water, what happens to Tibet’s ecology has a wide impact. “I also have concern about the future of the Buddhist traditions that came to Tibet from Nalanda in India. Initial Buddhist contacts began in the 7th century when Songtsen Gampo married a Chinese and a Nepalese princess. Despite marital links to China, Trisong Detsen in the following century chose to invite Shantarakshita and Padmasambhava from India to establish Buddhism in Tibet. We remember them as the Abbot, the Adept and the King. Shantarakshita was a great philosopher and logician who pioneered the Nalanda Tradition in Tibet. “Since then we have maintained this tradition through a combination of rigorous study and meditation. In exile, preserving our traditions has been crucial. We set up secular schools and we engaged in dialogue with scientists. 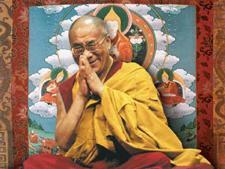 The ancient Indian study of the workings of the mind and emotions is alive among us Tibetans today. Shantarakshita also encouraged the translation of Buddhist scripture into Tibetan and it is said that this 70 year old man learned the language himself. Resistance to the introduction of Buddhism was met by Guru Padmasambhava. And accept them only then—not just out of respect for me. Where Thai Buddhist monks teach the Four Noble Truths and their sixteen characteristics on the basis of scriptural authority, we depend on reason and logic. “All the world’s religious traditions convey a common message of love and compassion, but promote it through different philosophical positions. The teaching of the Buddha focuses on the law of causality that good action results in happiness and bad action gives rise to misery. In this context, the Buddhas do not wash unwholesome deeds away with water, nor do they remove the sufferings of beings with their hands. They do not transplant their own realization into others. They liberate beings by revealing to them the truth of suchness. His Holiness explained that Maitreya refers to the Buddha as like a physician, his teaching as like medicine and the Sangha as like nursing companions. He declared that liberation is that stage when we have overcome all negative emotions and their imprints. He clarified that what we experience comes about as a result of our actions. Our actions are the product of negative emotions. He remarked that cognitive therapist Aaron Beck’s observation that our sense of anger or attachment is 90% mental projection not only to be helpful, but that it also accords with Nagarjuna’s advice. Through the elimination of karma and negative emotions there is nirvana. Karma and negative emotions come from conceptual thought. His Holiness went on to say that after decades of thinking about what Nagarjuna taught he can see how important it is. He also expressed his appreciation of Maitreya’s approach to introducing the teachings by explaining the Two Truths, the Four Noble Truths, especially the truths of cessation and path, and the Three Jewels. He said that as a student of the Buddha, even at the age of 82, he continues to read and study the works of Nagarjuna. He urged his listeners not to regard what the Buddha taught as in the nature of blessing, but as something to study, something to which to apply your intelligence. His Holiness led the audience through a brief ceremony for generating the awakening mind of bodhichitta, explaining that the purpose of life is to be of service to others. From that he went on to give the transmission of the Praise to Manjushri and his mantra. Before leaving the stage, His Holiness explained that he had recently attended the Mayo Clinic for a thorough check up following treatment he had last year. He reported his doctors satisfied. His Holiness drove from the Minneapolis Convention Center directly to the airport where he boarded a flight to Boston. He was greeted enthusiastically on arrival there by members of the local Tibetan community who presented a thoroughly traditional welcome.